Writing the Christmas story I’m sharing today, I thought about the ways memory shapes and defines our experiences of people and events. If memory shapes our perceptions of others, then our actions shape their perceptions as well. Asking questions about memory forces us to ask how we want to be remembered and, in a deeper sense, what kind of life we want to lead. I spent a long time obsessing over what to write. Being joined by four amazing writers—friends whose work I admire—upped the ante, I’ll admit. One night, as I lay in bed trying to fall asleep, I remembered the doll my aunts had given me one Christmas. The gate open, I spent much of the night reliving Christmas Eve celebrations at my grandmother’s house. As often happens, writing put random memories into perspective, and I realized it wasn’t the doll, or the gift, that mattered, but that my aunts had seen me. 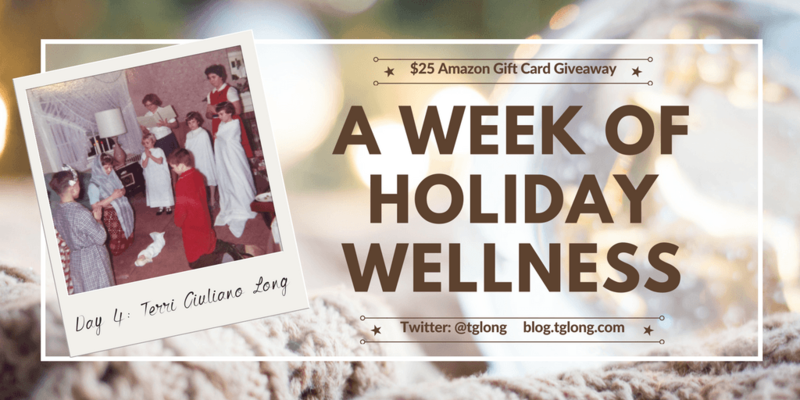 Being seen, connection—aren’t those the gifts we all really want? When I was a little girl, I dreamed of being a nun. From the first through sixth grades, I attended the St. Stanislaus parish school across the street from our church. Bordered by the church and rectory at front, the Catholic graveyard to the left, the convent with its towering woods to our back, our tiny school felt safe and secure. The faculty was comprised mostly of nuns, who swept through the halls in their flowing black habits, with an authority granted by God. I admired the sisters, romanticized the purity of their marriage to Christ. If entering the convent was a sacrifice, it was also the ultimate good. My third-grade teacher, Sister Marie Patrice, had a beautiful face framed by a starched white wimple, an easy smile, sparkling eyes. I loved her and wanted very much to be like her. Maybe one or both aunts asked about my dreams for the future. Somehow, they knew. Until I was a teenager and my family moved to Massachusetts, six hours north, we spent every Christmas Eve at my grandmother’s house. Like most Italian families, we ate fish—pasta with clam sauce, smelts, a dried salt cod we called baccalá, and others I’ve long since forgotten. 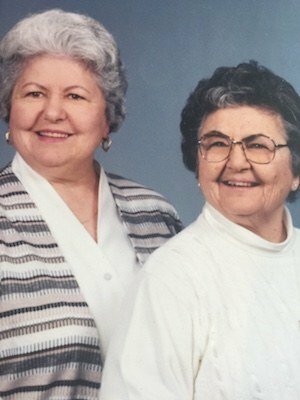 My aunts, Josie and Gilda, lived with my grandmother. The eldest of my father’s four siblings, Aunt Jo had been a second mom to my dad, having left school early to care for him so their mother could work. Small and dark, constantly smiling, Aunt Jo was a cheerful bundle of unconditional love. A teacher, the first in our family to graduate college, Aunt Jill was a thinker; she watched over the family, encouraging us to work hard, to succeed, to reach for our dreams. Neither aunt ever married, and they loved their nieces and nephews as if we were their own. While the rest of us lived in row houses or twins, my grandmother and aunts lived in a single house with a big lawn—my grandfather’s dream house, I’ve been told—a magical place that had seen its share of hardship and grief, but, in my memory, stands out as happy and light. Driving up to the house on Christmas Eve, you’d see, on their lighted side porch, a life-sized nativity scene. 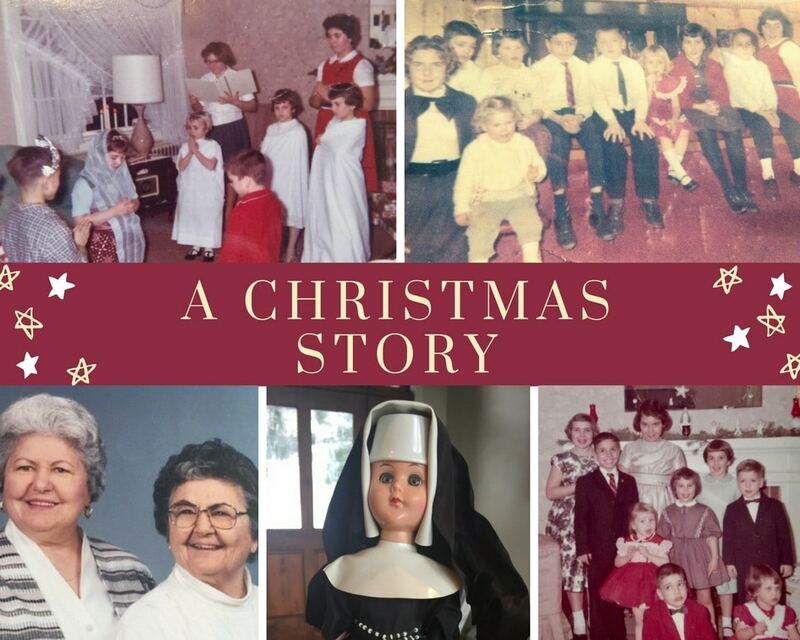 For a Catholic-school girl, the nativity was the heart and soul of the holiday season. In class, we’d decorated shoeboxes to serve as a barn. Throughout Advent, I’d recorded each good deed I’d done on a strip of paper, laid the paper in my box. By Christmas, I’d made a soft, warm bed for baby Jesus. The nativity scene brought humanity to my blossoming faith. Christmas in my memory was white. The snow would flurry as we pulled into the drive. It might amount to only an inch, but it was enough to light the way for Santa and his reindeer. I’m second to right, in a furry white sweater and black pants. 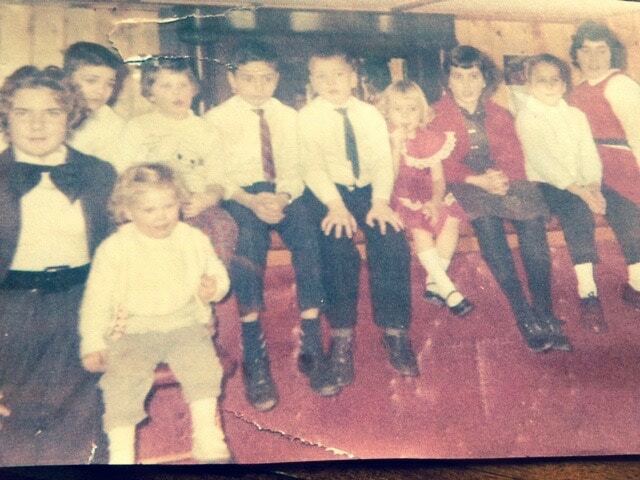 Marie is at the far left; her sister is in the red dress, fourth from the right, two down from me. You’d walk in the door, all crinkly in your new Christmas dress, into Aunt Jo’s waiting arms. From downstairs wafted the sound of your cousins, laughing and shouting, and from the small second kitchen in the basement swirled the pleasant tang of garlic and tomatoes and fish. We’d carry our coats to a bedroom, and race down the stairs to join in the fun. On the record player, Peggy Marsh was singing, I Will Follow Him. Aunt Jill was singing along with her—she sang in St. Stan’s choir, after all. There isn’t an ocean too deep… One of the female cousins might have joined in. Or a mountain too high it can keep…keep me away. Dinner sped by. Always the same: All that work and five minutes to eat. Then we girls—it was only ever the women back then—were at the sink, helping the adults wash and dry dishes. After dishes came dessert—platters of cookies: beautifully decorated sugar cutouts and butterballs, thumbprints filled with jelly dusted in sugar, Italian waffles, anise-flavored biscotti. My grandmother made Struffoli, honey balls shaped like a tree. Maybe there was a cheesecake, and there were bowls of fruits and nuts if you were too stuffed for anything more. Then us kids were off: playing school, scaring each other in the utility room, goofing around behind the bar. Later, bells would jingle and we’d dash upstairs, to the windows and doors, search the night sky for a sneak-peek at Santa. Some years Santa came to visit the kids, and some years an older cousin, our parents’ age, would stop by with his accordion, and we’d sing holiday songs. Every year us kids put on a Christmas play for the grownups. I’d love to say I enjoyed it, but my cousin Marie, the eldest, took charge, and I hated how bossy she was. Of course, you’d have to be to write an annual play, assign parts, plan costumes, direct ten fidgety kids through practice each week—starting Thanksgiving Day—corral us when it was time to put on the play. Every year, without fail, Marie gave her little sister the lead, while I’d be stuck playing Mary’s husband, Joseph, or, worse, a boring shepherd with no lines. The slight made me sulky. I must have been an angel that year. You can see how excited I am. 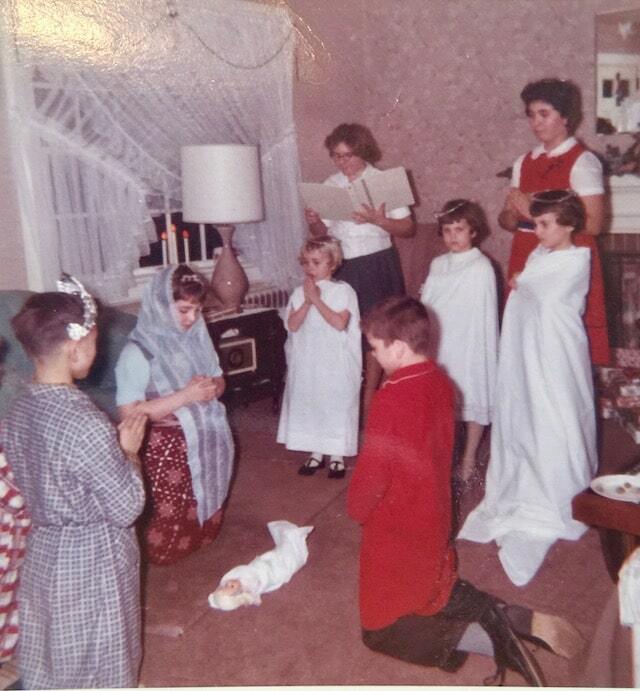 I’m on the right, with the long sheet draped over the floor. Marie is holding the script. Her little sister is in front of her. Thinking back, I remember auditioning—we actually auditioned! Knowing—stupid me—even as I sang whatever song she’d assigned, I wouldn’t be picked. I can’t say which cut deeper, my shame for having a horrible voice, or anger over the injustice. The audition was a sham! The parts had already been cast! For once, I thought, moping, just once, why couldn’t I be the star? 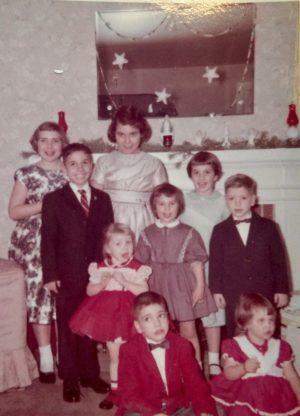 Marie is in back, in the black and white flowered dress, her sister is the blonde in the red dress; I’m in a purple dress with a white Peter Pan collar. Funny how memory works. Telling the story, I remember the play being fun. The grownups enjoyed it (or pretended they had) and, Aunt Jo and Aunt Jill more than anyone, fussed as much over the voiceless supporting actors as they did over the adorable star. After the play, it was time to open our gifts. Gifts have never been an important part of Christmas for me. Selfishly, I love giving gifts, but not so much the receiving. The adults exchanged small joke gifts while we played or after we’d gone to bed, so it was only the kids—a gift for each from our grandmother and a gift from Aunt Jo and Aunt Jill. Aunt Jo was always behind the camera, snapping pictures, so Aunt Jill must have handed out gifts. We took turns opening, from youngest to eldest, I imagine. When my turn came, Aunt Jill handed me a box, and I cradled it in my arms, wondering what could possibly be inside. I still have the doll—my very own Sister Patrice. I don’t know where they found it, my aunts, if they saw the wonder in my eyes, or leaning in for a kiss, heard the thump of my heart. It’s these small things, the loving gestures, the connections, the gifts of ourselves, I love about Christmas. As an adult, in the rush and the hubbub, I sometimes overlook the things that matter most: bake cookies none really wants to eat rather than sit by the fire with my husband. Spend weeks obsessing over gifts when I could be visiting a friend. Or work myself into a tizzy preparing the house for the arrival of our kids when all they really want is for me to relax. It isn’t the cookies or the gifts or the home-beautiful décor people remember. It’s the seeing and being seen, the knowing and being known, the connection. 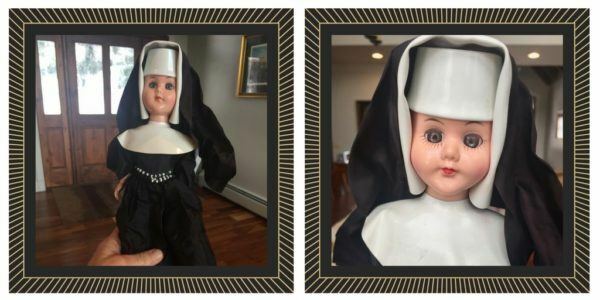 The nun doll we cherish.